I started out on this post, rather naively, by looking for some illustrations of 18th-century criminal trials. It took me a while to realise that no such thing existed; there were no hearings in open court in Ancien Régime France, no adversarial process, no defence counsels. Proceedings and deliberations took place behind closed doors - though increasingly under the gaze of public curiosity. From the 1760s onwards the penal system began to come under criticism from Enlightened theorists and reformers eager to highlight abuses of justice. Nonetheless, it had its internal logic and, like other aspects of 18th-century French administration, was often tempered by sensible and humane practitioners. 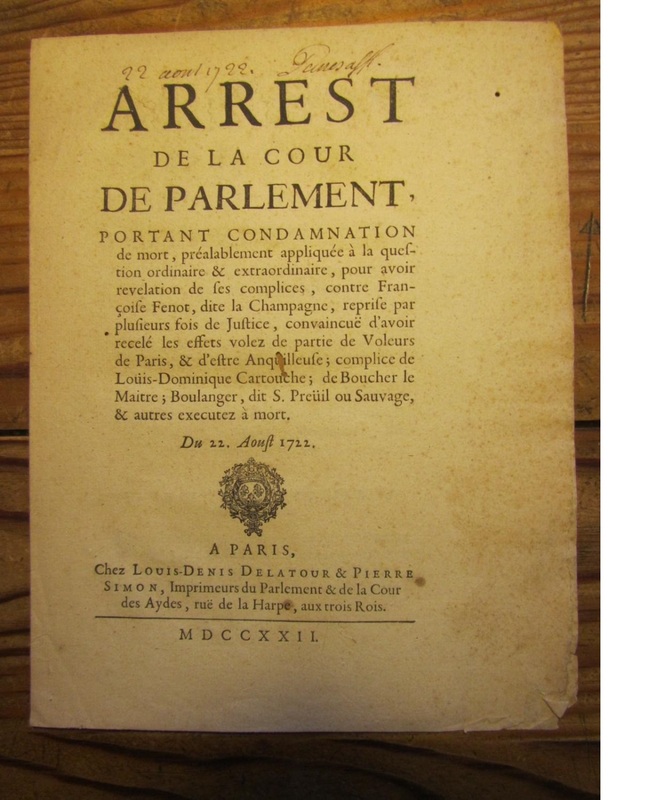 Criminal law had been codified under Louis XIV in the great 1670 Ordinance of Saint-Germain-en-Laye, which clarified and consolidated procedures sanctioned by venerable tradition (partly laid down by the Ordinances of 1498 and 1539). The system is defined as "inquisitorial", that is it was based on the establishment of objective "legal proofs" to guilt. This was supposed to counter personal bias of the judges, though in later years the system came to seem unacceptably weighted against the accused. In addition, a plethora of courts judged specialised crimes, such as smuggling and peculation. In this age of improvement, the courts often boasted new imposing buildings and splendid judicial attire. 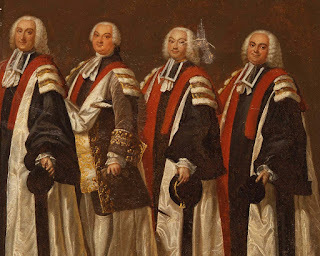 The Judges of the Parlement of Paris, were especially intimidating in their red robes; whilst black judicial habits - often fine black velvet - singled out the barristers. Here, broadly, are the stages in the judicial process - taken mostly from Des tribunaux et de la procédure du grand criminel au XVIIIe siècle, a well-researched and accessible old account, published by Charles Berriat-Saint-Prix in 1859. The text concerns offences categorised as,"les affaires du grand criminel", that is crimes which attracted the penalties of execution and other physical punishment, or infamy. illustrating the life of the poisoner Henri-Augustin Trumeau. 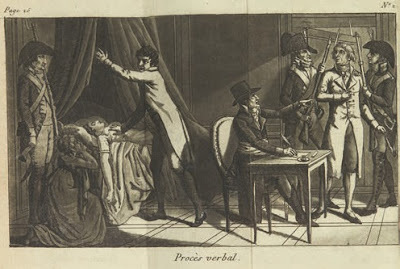 First interrogation: The accused was now brought before the judge, in the case of a flagrant délit in the first convenient location, otherwise in the judical chamber or in the gaol. The interrogation was supposed to take place within 24 hours of the crime. According to the commentator Daniel Jousse, this requirement was often neglected; the accused waited eight days or more before being heard [Justice criminelle, vol.2, p.254]. (49) Serious delays were by no means rare. In the notorious case of the "Trois roués" in the 1780s the men languished in prison for two years before their trial even began. The oath: The accused was first made swear an oath to tell the truth; laity lifted their hand, ecclesiastics put theirs on their chest (50). It comes as a surprise to learn that, in the Conferences which preceding the Ordinance of 1670, Lamoignon, the president of the Parlement of Paris, had opposed the imposition of an oath, on the grounds that the accused should be free to deny the truth in order to save his life (51). Nearly a hundred years later Beccaria was to make much the same point. A confession at this stage dispensed with the need for information or any further proofs. Later critics feared, with good reason, that the proceedings were stacked against the ill-educated and inarticulate defendants, faced with the commanding presence of magistrates brought up on lifetime of rhetoric. 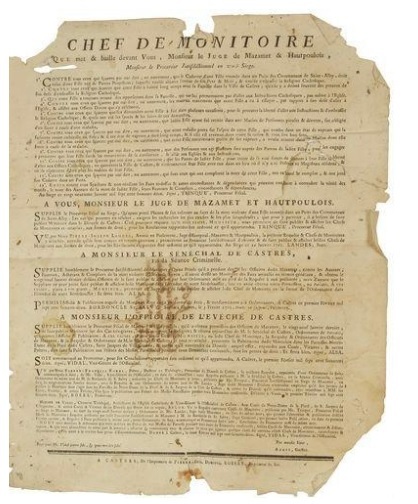 Public appeals for witnesses - les monitoires - were employed for "serious crimes and public scandals" or if evidence was difficult to come by. The judge requested the monitoire be read out from the pulpit in all the parishes of a diocese. Individuals were constrained to reveal what they knew to the priest, on pain of excommunication. It was a system which was to prove highly detrimental in the Calas and La Barre affairs (60). In serious cases witnesses were required to appear personally to affirm and add to their testimony (le récolement) They could also be confronted by the accused, who were given the opportunity to voice their objections (les reproches). As Voltaire complained, this proceeding was not always carried out. Torture: In cases of strong presumption of guilt, preliminary torture (la question préparatoire) could be used in order to force a confession. To be valid, any admission had to be subsequently repeated, without physical duress. At this point he might be permitted, at the discretion of the judge, to present his counter case, les faits justificatifs. Counsel was allowed only in cases which did not involve crime against the person - fraud, bankruptcy, forgery and peculation of various sorts - where there might be a need to assemble evidence and advise on the law. In capital cases recourse to defence lawyers was absolutely forbidden. As Voltaire remarked, only extortioners, fraudsters and bankrupts were allowed the services of a lawyer. Appeal: Appeal to the presiding Parlement or Conseil was automatic for all cases attracting execution or other corporal penalties, including banishment (82). The prisoner would be transferred to the prison of the Parlement, the information would be considered and the accused again interrogated sur la sellette. They might also be allowed to present les faits justificatifs. (85). Judgment. For serious crimes, where the interrogation finished in the afternoon, judgment would be postponed to the following morning to ensure due deliberation. Jousse included a whole table of crimes that could not be judged until the morning (77). It was often complained that the texts of the judgments did not always include the reason for the condemnation. This was one of the first reforms put in place by the Constituent Assembly. The judgment was not pronounced but read to the accused person in prison. In cases of capital crimes, the accused was made to kneel to receive the verdict (86) Paradoxically, although the grades of proof were minutely laid down, the judge had considerable discretion over what penalties he imposed. Before execution, the condemned could be subjected to further torture (la question préalable) to compel them to reveal their accomplices.